Kombucha is easy to brew. It is healthy and delicious. Once you get used to the continuous brew, you can do it in your sleep. 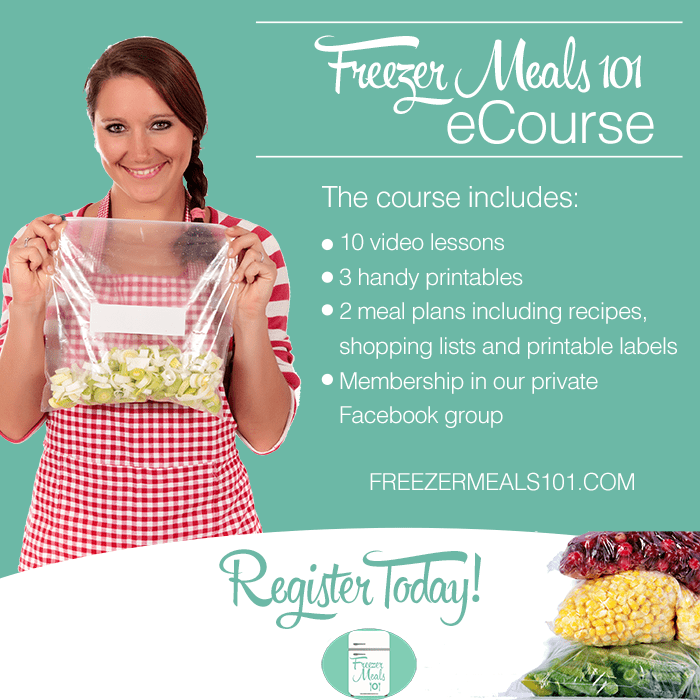 Here is some great info. I am not a professional, but a kombucha be lover that has been doing it for about 2.5 years. Yes, 2.5 years of an unbroken, continuous brew. 1. Organic black tea (loose leaf or teabags). This is the one I use and love. 2. A wide mouth glass container that holds at least 3 quarts worth of liquid. I like this one. 5. Natural fiber cheesecloth. I like this one. If you are getting a scoby in some kombucha (about 1 cup) from someone, then that is all the starter you will need. If you are purchasing a dehydrated one, you would need to add some vinegar to the first brew and dispose of the first brew when it is done. You subsequent brews will be great. *Make sure you have all of these items before you get your scoby. Once you have everything, you are ready to start your brew! Make sure your scoby NEVER touches any metal, so everything is either glass, wood or plastic. Make sure you wash everything very well and RINSE very well so there are no traces of soap at all. My recipe is for 3 quarts of brew. Adjust accordingly. 1. In your glass container, brew 6 tea bags’ worth of tea in hot water. Let it sit, uncovered, for about 20 minutes (I set my timer). If you like stronger tea, add a few more bags, but for 3 quarts, I find that 6 bags work well for us. 2. While the tea is still warm, remove the teabags from the glass container and mix in 1 cup of white organic sugar. Mix until it is completely dissolved. No other kind of sugar will work well for this, so make sure you use only white sugar (preferably organic). 3. Fill up the container to equal 3 quarts of tea, so add water as needed. I made marks around the outside of my glass container with a permanent marker. That way, every time I start a new brew, I just fill it up to the mark. Masking tape will also work well. 4. Make sure the tea is at room temperature before you put the scoby in. Do not close the container with a tight lid. The scoby needs air to breathe. I set cheesecloth (folded in several layers) over the top and secure it with a rubber band. Fruit flies LOVE kombucha brews. You want to make sure none ever get in (or any other insects), so secure tightly in a way that the scoby can breathe and be protected. 5. Let it sit in a dark, cool place. We have it in our pantry. It should never sit in direct sunlight or in a bright room for extended periods of time. 6. Forget about it for now, but mark your calendar for 2 weeks from when you started the brew. How do I know my scoby is healthy? 1. The scoby is yeasty-looking (creamy light orange), but not moldy. If it is moldy (hairy, or with fuzz of any color), discard the entire brew. 2. The scoby is growing. 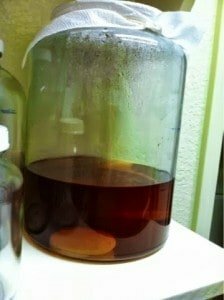 If your scoby was smaller than the circumference of the container you are brewing in, you will notice that a slimy film will begin to develop. That is normal. It is the scoby. Scobies grow to the size of their containers to cover the entire top. 3. The scoby is growing a baby on top of it. After a couple of weeks, you will notice that your scoby is getting thicker. No, it isn’t getting fatter. It is actually creating a baby scoby. 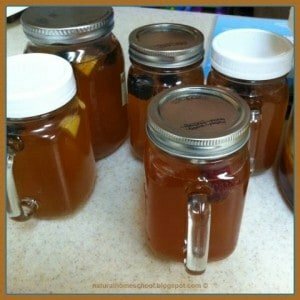 By the time your brew is ready, you will have about 3 quarts of wonderful kombucha and 2 scobies instead of one. 4. There may be bubbling/fizzy action going on in the tea. 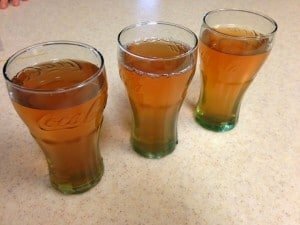 Is the kombucha brew ready? In about 2 weeks’ time, you will go to your kombucha and take a sample of it with a wooden or nylon spoon. Remember, no metal! 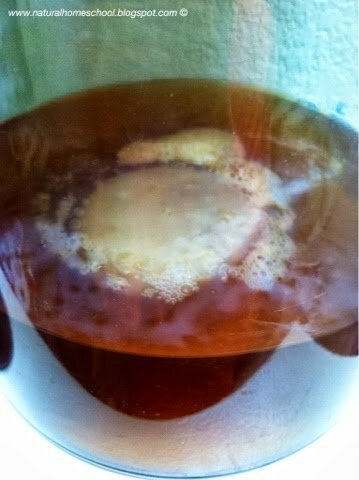 The yeasty bacterial scoby feeds off of the sugar you mixed in the tea. The sooner you stop the brewing process, the more sugar will still be in the tea, so it will be sweeter. We personally like less sugar in ours, so ours is more tart (we wait 3-4 weeks instead of 2). If you live in cold climates, it will take longer for the brew to complete. If you like the taste, you can stop the brewing process and get ready to flavor and enjoy. See instructions for this below. If you feel like it is too sweet, then cover it again and wait another week before tasting it again. I love these mason jars with handles. 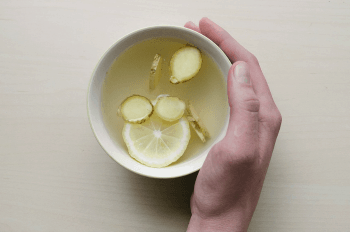 Finding flavors for your tea is super easy. You can add organic juice in any flavor. My neighbor loves the pomegranate juice in her kombucha. So, once your brew is ready, get your clean mason jars ready. You can use the plastic strainer to scoop your scoby mother and baby out or do what I do: just leave them in for now. Pour kombucha into each mason jar to fill up about 3/4. MAKE SURE YOU ALWAYS LEAVE ABOUT 1 CUP OF THE BREW IN THE JUG WITH THE SCOBY. THIS IS YOUR STARTER FOR YOUR NEXT BREW. You do not need to wash the jug, but do keep it wiped clean on the outside. You can flavor all of your jars the same or experiment to see what you like best. 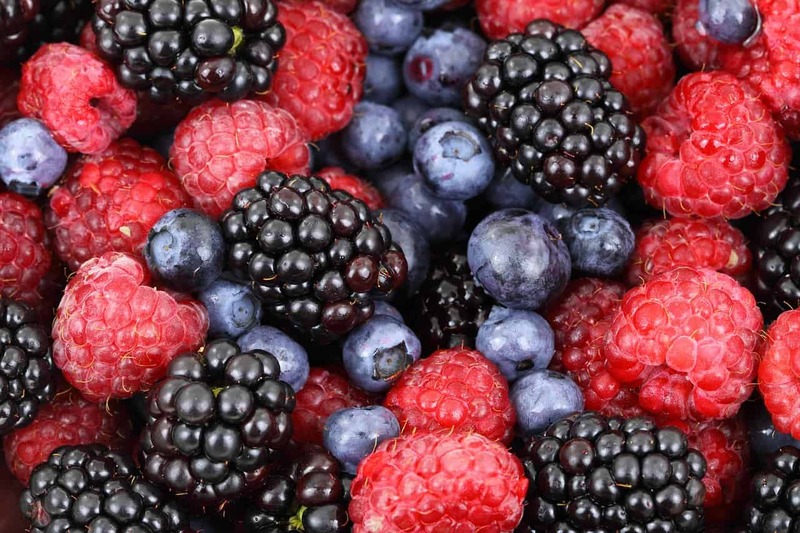 I prefer fresh ingredients over store-bought juices (including organic ones), but the choice is yours. PLEASE DON’T LET THE SCOBY HANGING. START A NEW BREW RIGHT AWAY TO KEEP THE CONTINUOUS BREW UNBROKEN! 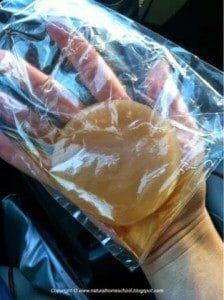 Discard or give away the mother scoby. Keep the baby scoby. It is best to use the youngest generation you have available. There are things you can do with your extra scoby. Some people put them in their compost piles, some give them to their dogs as treats, others use them as facial masks and yet others make gummy snacks or chews out of them. After the fruit has been marinating and flavoring the kombucha for 24 hours, scoop the fruit out of the kombucha, put the lids back on and put the jars in the refrigerator. Refrigerate for another 24 hours before enjoying. The cold will stop the brewing process completely, so it is important that refrigeration takes place. I hope these tips have helped. Please comment below with questions or doubts. How long does the komucha last in the fridge? I am so excited to have come across this today! I love Kombucha, but it can be so expensive. I’ve pinned it, and am going to try it. Thank you for sharing. Thank you for this Kombucha recipe… you make it look easier than I thought.